If you’ve followed any of my photos or random writings—and I’m assuming you have otherwise you wouldn’t be seeing this—then you know that I like to take photos of people that I meet and tell a bit about their story. All types of people. Jeff is a jovial fellow from the small village of Bemus Point, NY and was all too happy to talk to me. Unfortunately I had an appointment to keep so didn’t talk long. 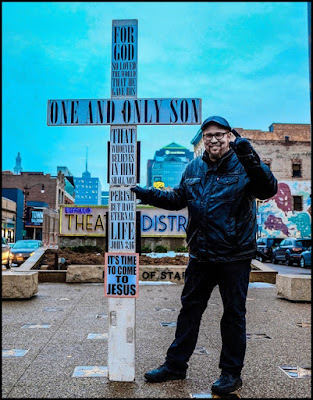 Nonetheless our short conversation was peppered with at least five “Praise the Lords.” Before talking to me he wasn’t yelling anything out or harassing anyone, just standing there with his large cross and a pocket full of tracts. When asked if he’d been harassed he said only a couple times. 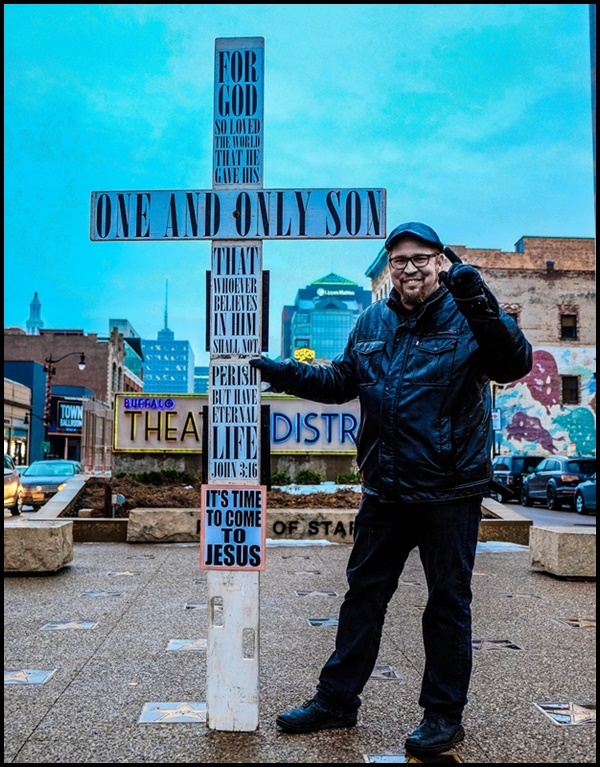 When also asked why he was standing here with the cross he smiled and simply said, “To spread the good news.” He also mentioned that he was previously standing inside a subway station but was asked to leave. When I was getting ready to leave I thanked him for talking to me and allowing me to take his photo. “Praise the Lord, Joe” is what he said as I parted. I told him that I tried to and he smiled again. As I pedaled away I glanced back and saw Jeff standing there in the light drizzle, smiling. All I could think is that we all have figurative crosses to bear but Jeff showed his forthright. There are all types of people in the world and today I met Jeff and my life is better because of him.